Oregon ArtsWatch readers know all about Portland’s burgeoning alternative classical music scene. But the opportunity to hear contemporary classical music can be hard to find outside Portland and even sometimes there. Fortunately, the Internet makes it possible to explore a bounty of today’s music from around the world through outlets such as SoundCloud®, YouTube®, and webcasting. As the fall concert season begins in Oregon, one of the best places to experience new music by emerging composers is on your own computer. The University of Oregon’s School of Music and Dance (SOMD) has recently joined other institutions like the University of Texas at Austin, Juilliard School, and Yale University in making live programming from its Beall Concert Hall available for online viewing. 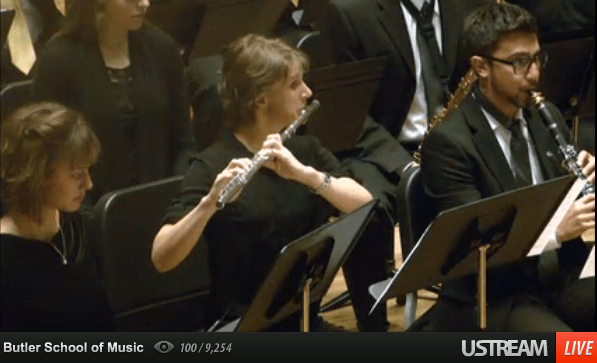 The University of Oregon began webcasting last fall with performances by the University Symphony, Oregon Wind Ensemble, Symphonic Band, and other SOMD ensembles. Most of the senior and graduate level student recitals have also been webcast. What I enjoy most about webcasts is not only the ability to access music by noted contemporary composers, who are usually represented on SOMD programs, but also the music of emerging composers who may one day become the established names in music. This past summer, the University of Oregon offered a series of webcast performances of new music by participants in the 2013 Oregon Bach Festival Composers Symposium. The Living Music Now series presented three evenings of new works by young composers from all over the world. Some of these live-streamed events have been archived on YouTube. See below for some links. The quality of live streaming varies from one institution to another. Some sites use only a single camera placed at the back of an auditorium, which can be difficult to view on small screen mobile devices. Others have invested in multi-camera systems and switch from long shot, medium shot, to close-ups. Such a system is used at the University of Oregon. I prefer using my desktop computer, to which I have attached a pair of high-quality speakers. The sound quality from the UO is very good. Having a high-speed Internet connection assures optimum quality. I do enjoy viewing webcasts from other concert halls and institutions. A favorite is the audio and video live streaming from the University of Texas, Austin where many graduates from the UO School of Music and Dance study for advanced degrees in composition and music performance. At 5:30 PST Monday, October 7, I’ll be listening to a CLUTCH (New Music by UT Composers) concert that includes the performance of compositions by former Oregon Ducks Brandon Scott Rumsey and Chris Prosser. Join me! The UO School of Music and Dance will continue to webcast programming from the Beall Concert Hall this fall. On-demand streaming isn’t available. The school hasn’t yet announced this season’s lineup, but the SOMD’s Concert and Event Calendar provides the latest information about live streaming. It’s an excellent way for Oregonians to hear what the next generation of composers is creating. 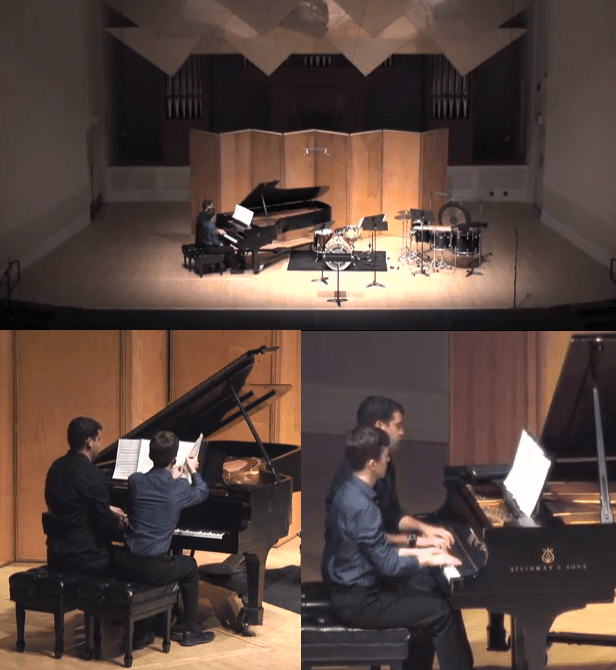 Here are seven examples of new compositions that were premiered during the OBF Composers Symposium and viewed ‘live’ worldwide from Beall Hall. Andrew Sigler, Sparrows Jump Nine Sandpipers, I. Quicksilver, performed by the American Creator’s Ensemble conducted by James Kallembach. Jacob Walls, Prelude and Changüí en F, performed by Adam Marks (piano) and Jacob Walls (piano). Alexander Johnson, Ah Sunflower, a choral setting of text by William Blake, with Craig Hella Johnson conducting the OBF American Creators’ Chorus. Travis Alford, Riffs and Echoes (2013), Travis Alford (trumpet) and Milo Fultz (double bass). Saunder Choi, Paper Boats, a new setting of Bengali polymath Rabindranath Tagore’s poem for a cappella mixed choir, performed by the American Creators Ensemble Chorus under the direction of Craig Hella Johnson. Lacy Rose, Hope I, Movement I (Live), performed by Lacy Rose (soprano), Andrew Stiefe (viola), and Adam Marks (piano). Gary Ferrington is Senior Instructor Emeritus, Education, at the University of Oregon. Want to read more about Oregon contemporary classical music? Support Oregon ArtsWatch!